Frederic Harrison Smith Jr., was born at Fort Monroe, Virginia, in 1908. He attended the United States Military Academy at West Point and graduated a second lieutenant of Field Artillery, June 13, 1929. In late 1939, Captain Smith returned to the States as operations officer of the 36th Pursuit Squadron. A few months later he became its commander at Langley Field, Virginia. Within a year after Captain Smith assumed his first command, he was appointed commanding officer of the Eighth Pursuit Group, Seventh Pursuit Wing, at Mitchel Field, New York. In April 1946, the general was appointed chief of staff of the Strategic Air Command at Andrews Field, Maryland, and in February 1947 became national commander of the Civil Air Patrol. On October 10, 1947, following establishment of United States Air Force Headquarters, General Smith was appointed chief of the Requirements Division under the director of Training and Requirements Division in the Office of the Deputy Chief of Staff for Operations. Major General Smith was appointed assistant for programming in that office in February 1948, a position he held until Aug. 14, 1950. He was then named commanding general of the Eastern Air Defense Force, Stewart Air Force Base, New York. General Smith became vice commander of the Air Defense Command, Ent Air Force Base, Colorado Springs, Colorado, March 1, 1952. He served there until June 20, 1956, when he was promoted to the rank of lieutenant general and again joined the Fifth Air Force, this time as its commander. In September 1958, General Smith returned to the U.S. to assume command of the Air Training Command, with Headquarters at Randolph Air Force Base, Texas. He arrived in Germany in August 1959 to take command ofthe 4th Allied Tactical Air Force and the United States Air Forces in Europe. 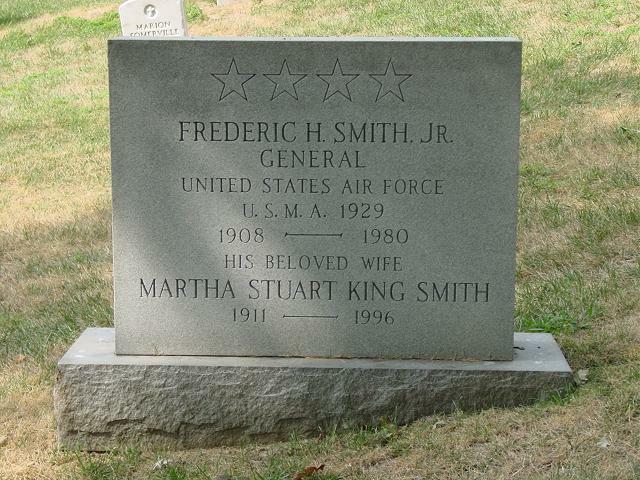 General Smith was buried with full military honors in Section 3, Grave 4022, Arlington National Cemetery.